This Juwel Primo Aquarium is one of the most efficient fish tanks available in the marketplace today. It comes with an advanced filtering system and stylish LED lighting that can make an impressive and enhanced addition to your living space. This hi-tech aquarium has so many exciting features so if you are planning to purchase this quality fish tank aquarium, then it is good to check the feature highlights below. It will help you choose if this fish tank is the one for you! Juwel have added PrimoLux and NovoLux 80 LED light to this beautiful aquarium; because they ensure energy efficiency up to a range of 5, 10 watts. This lighting system can be enhanced by installing multiple LEDs to cover as per user requirements. The Juwel Primo 110 LED aquarium is loaded with a specially designed Bioflow super filter system. This system is tested by professionals, and it is proven to be safest among all competitive filter mechanisms, ensuring efficient two-stage biological and mechanical filtration. This well designed Bioflow super filter system is equipped with Eccoflow 500 circulating pump that is highly energy efficient as well. This aquarium also contains an adjustable water heater that helps to maintain the perfect temperature inside the aquarium. JUWEL AquaHeat system works on 50-watt power, and it is TUV/GS certified to ensure quality performance. After all these technical details, let us talk about the beauty of this aquarium. Its looks portray a perfect aquarium for any house; It can enhance the overall image of your living room and make it a happy place for relaxing enjoyment. Solid 6 mm glass cover. The moderate size that suits every home. 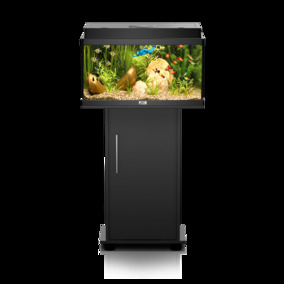 If you are looking forward to buying an attractive aquarium for home décor or want to present it as a gift for an upcoming birthday, then it is good to buy a Juwel Primo 110 Litre Aquarium.